Delcam will highlight developments in four programs from its range of manufacturing software on stand H57 in Hall 8 at the Euromold exhibition to be held in Frankfurt, Germany, from 3rd to 6th December. The key technologies on show will be the new Vortex strategy for high-speed area clearance, the latest additions to the mill-turn functionality in FeatureCAM, On-Machine Verification with the PowerINSPECT inspection software and the 2014 release of the Delcam Electrode suite of software. The new Vortex strategy is included in the 2014 releases of both Delcam’s PowerMILL and FeatureCAM CAM systems. Vortex, for which Delcam has a patent pending, has been developed by the company specifically to gain the maximum benefit from solid carbide tooling, in particular those designs that can give deeper cuts by using the full flute length as the cutting surface. It can be used for two- and three-axis roughing, three-plus-two-axis area clearance and for rest machining based on stock models or reference toolpaths. 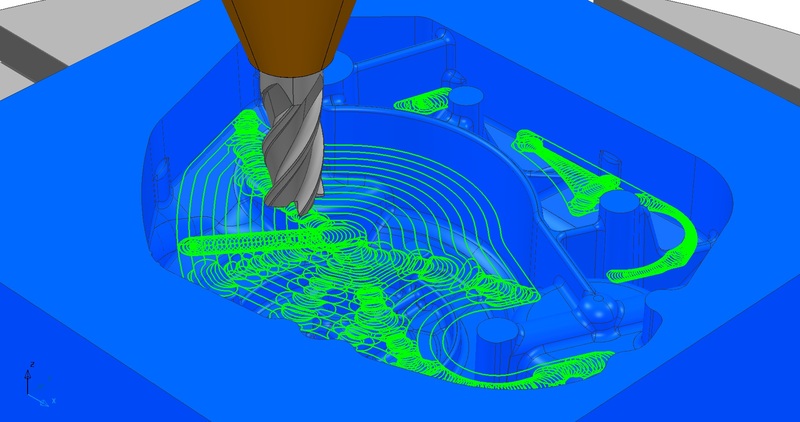 Unlike other high-speed roughing techniques that aim to maintain a constant theoretical metal-removal rate, the Vortex strategy produces toolpaths with a controlled engagement angle for the complete operation. This maintains the optimum cutting conditions for the toolpath that would normally be possible only for the straight-line moves. As a result, the cutting time will be shorter, while cutting will be undertaken at a more consistent volume-removal rate and feed rate, so protecting the cutter and the machine. A series of trials run by Delcam on different machine tools within its Advanced Manufacturing Facility has shown that a time saving of at least 40% is not untypical. The 2014 version of FeatureCAM also includes a number of new options for turning, four-axis rotary machining and turn-mill operations. These include the ability to program and simulate the movements of the steady-rest that can be used to position large parts during turning and the tailstock that can be used to hold long parts on centre during machining, an option to add fillets to any sharp corners, for example, for automatic deburring, without having to edit the geometry, and a faster method to change the index axis part-way through programming. FeatureCAM was the world’s first feature-based programming software when it was launched in 1995. Constant development since then has ensured that the system has retained its leadership in programming speed and ease of use, while an increased range of strategies has been added to provide more efficient toolpaths giving greater productivity on a wider range of machines. On-Machine Verification with Delcam’s PowerINSPECT inspection software allows initial checking of machined parts to be carried out in situ on a CNC machine tool rather than having to transfer them to coordinate measuring machines for inspection. The main advantage is that any mistakes are discovered where they can be corrected – on the machine tool. Repeated cycles of machining and inspection, interspersed with long set-up times on the respective pieces of equipment, are avoided, meaning that overall manufacturing times can be reduced. On-machine verification can give huge time savings by enabling the quality of the component being machined to be monitored at all stages in the manufacturing process. This allows any errors to be detected earlier, and so corrected more quickly and at lower cost. Another program that has seen significant development is the Delcam Electrode integrated solution for the design, machining and inspection of electrodes. The latest enhancements include support for burn-vector electrodes, automated machining of electrode frames, batch processing of multiple machining projects and faster generation of electrode drawings. Delcam Electrode combines functionality from PowerSHAPE, PowerMILL and PowerINSPECT to give a completely integrated solution for the design, machining and inspection of electrodes. At the heart of the solution is a novel file format – the .Trode file. This contains all the information for each electrode project, including not only the electrode design but also the machining and inspection information, plus the set-up sheets for its manufacture and use. Having all the required information in a single file simplifies data management as well as increasing overall efficiency.